Denmark is a small town about 420 Kilometres from Perth. 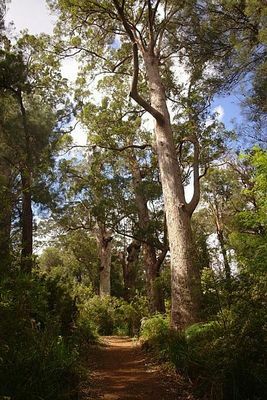 If you take a short scenic drive down the South Coast Highway you will come to the Valley of the Giants, located in the Walpole-Nornalup National Park. The Valley of the Giants gets its name from the grove of large red Tingle Trees that are found there. Known as the Ancient Empire, these trees are massive and some of these 'giants' have a base that is 16 metres in circumference and many of them are more than 400 years old. More than 40 metres above the forest floor is the tree-top walk and this stretches for 420 metres through the forest canopy, around and through the Tingle trees. 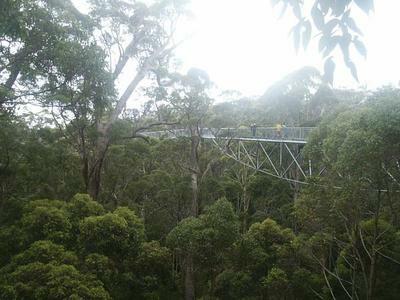 Take a walk along the suspension bridge and explore the tree tops with the whole family. It's an entirely new experience and it's quite amazing. The view is unbelievable, the air is clean, crisp and sometimes a bit misty. High above the world the silence is palpable, it is quiet and serene, but off in the distance you can still hear birds and other noises. 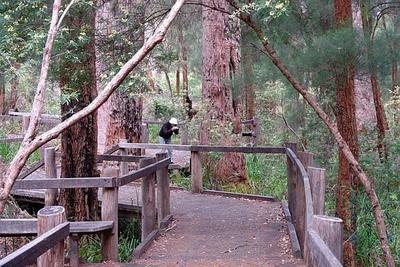 The walkway is well constructed and you feel safe as it ascends gradually to the tops of the giant Tingle trees. The suspension bridge is perfectly safe, it sways gently, and even though you can see through it into the gully below, it gives you a sense of security. However, if you are not good with heights this might not be for you. At the end of the walk the bridge gradually descends again towards the pathway and the forest floor beneath. The ascent and descent stages of the bridge are both shaded easy walking. Beneath the tree-top walk is a pathway or boardwalk that winds through the forest of mighty Tingle trees. This is called the Ancient Empires Walk and is an extension of the tree-top walk. This walk is just as amazing as the tree-top walk. It is so quiet down in the forest and you feel so small. Wandering around the giant Tingle trees, there are plenty of quiet places to sit and rest and take in the majestic beauty that surrounds you. The boardwalk takes you under the ancient canopy on a circular path that leads back to the entrance. Everything looks a bit different depending on what time of day you take the tree-top walk or the boardwalk walk. I think that it's better to go early in the morning, it's quieter and more peaceful and there are generally not many people around. You will need a good pair of walking shoes and some water and don't forget your camera. Depending on what time of year you go you will need sunscreen, a hat or maybe a jacket or raincoat. The Valley of the Giants is open every day of the year between 9am and 5pm. This tree-top walk is a popular tourist attraction. It will be a different experience if there are a lot of people on the walk than if there are just a few. The Valley of the Giants is an amazing, truly unique place and well worth a visit.